The webinar will feature recent CAREX Canada research on radon testing in Canadian schools, as well as background information on what radon is, how exposure occurs, and why testing is important. The Kootenay Columbia Teachers’ Union will share their experience conducting a radon testing program, and Health Canada will provide guidance on how to test schools and remediate where necessary. 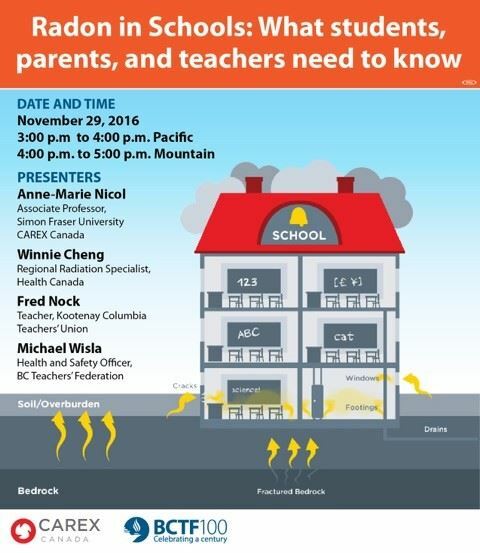 The webinar is presented in partnership with the British Columbia Teachers' Federation (BCTF), which has prioritized radon through their work with CAREX Canada, and sparked CAREX Canada’s research on radon in schools. Click here to join the webinar at the specified time and date. Before joining, be sure to check system requirements to avoid any connection issues. For more information on radon, visit CAREX Canada’s radon page.